And I’ve seen other kids on the autism spectrum benefit from the anxiety-reducing properties of them. They’re not cheap – and if you’re a not-so-well-off parent of a child on the spectrum, they’re of a price that can hurt. So, anyway. Here’s the givealittle link. Song I always associate with sixth form, although according to this it came out a couple of years previously. Whatever. They always seemed to be playing it on Hauraki in 1980. Today is International Chronic Fatigue Day. I tend not to write too much here about personal stuff because, well, its personal. I’ve got a residual Presbyterian inhibition about letting out that sort of thing. Besides, I don’t want to bore people. Not sure why today is different, but it is. My Other Half has chronic fatigue, and has had it now for, I think, 10 years. She had to sell her business after she got the condition. For now, she can’t work. I was diagnosed with it myself when I was at University. I’d never heard of the condition at the time. Things like that happened to other people as far as I was concerned. I’d had glandular fever the previous year: had hepatitis simultaneously, which can happen. Bounced back and felt fantastic: I was warned by the doctor it would take me to 2 years to get back to my previous level of health but I didn’t take much notice. I felt fine. But nearly a year later it was like slowly walking into a swamp. Each day I was more and more stuffed. I’d come home and just crash. Eventually I started crashing in the library. I was one of the lucky ones – I got over it. Slowly. But the years 1990-94 are years I was only half there, it seems. I’ve never had quite the same amount of energy I used to have, but of course at least some of that could just be the aging process. Oddly enough, I’m glad I had it. Partly because I think it’s a good thing for people who have had a pretty charmed life (and in retrospect I think had, up to that point) to get a knock-back or two. It meant I canned the law degree I had started and went back to journalism, which I’d done for four years before going to Uni. I think I’d have hated being a lawyer. Most importantly though (and this is perhaps linked to the first reason) it means I can understand what my other half is going through. A lot of people who have chronic fatigue lose their partner as well: it’s a difficult condition to cope with. Since then I’ve met quite a few people with it. There’s also a couple of reasonably high powered people around town who have had it and recovered, which is kind of comforting. Saw ‘Starter for 10‘ last Friday. Set at a UK Uni in the mid 80s and about a bloke who is determined to go on University Challenge and bed his blonde teammate. It doesn’t quite work out, of course, but it’s a damn good laugh. They seem to do Uni Challenge a bit different in the UK to the way we used to do it here. The year I was on it only a couple of teams took it seriously. Auckland wasn’t one of them. We took the attitude it was a week’s free holiday in Dunedin, and that was about it. The attached picture is from the Listener sometime in late 1989. I’m amazed I ever had that much hair. Note the mixed image – underneath the scarf and long dark overcoat is a check shirt bought from the local Dairy Factory back home. There was quite a bit of partying but I had glandular fever at the time and I’ve never drunk so much tomato juice in my life. The first night there the organisers – TVNZ – figured we’d like to see a video. They put a great deal of thought into it. You can imagine them thinking ‘what sort of film would people who go in for University Challenge most like?’ and came up with Monty Python and the Holy Grail. The room we saw it in was packed. Many of them there knew every word and kept talking along with the film. This completely annoyed the manager of the Massey team, because she was the only person in the room who had not seen it at least three times. Some of the teams had done a lot of training. One team was reputed to have creative visualisation exercises to motivate them, whereby they visualised the prize – a PC – on their desk. At least two of the teams – Waikato and Vic – had been selected quite a while before and had spent the ensuing period doing training quizzes. We’d had one training session. It was meant to be three hours but after the first hour we went to Shadows. We still nearly won. Came up against Vic in the semi and they were all completely hungover. The final – against Waikato – initially, was a draw. We’d got one question awarded though which turned out to be not right – from memory we had to name a bunch of South American countries which had something in common. Can’t recall what. Anyway, we’d named Paraguay, I think, which wasn’t right. Waikato challenged this, were proved right, and we had to re-enact and refilm two thirds of the game. 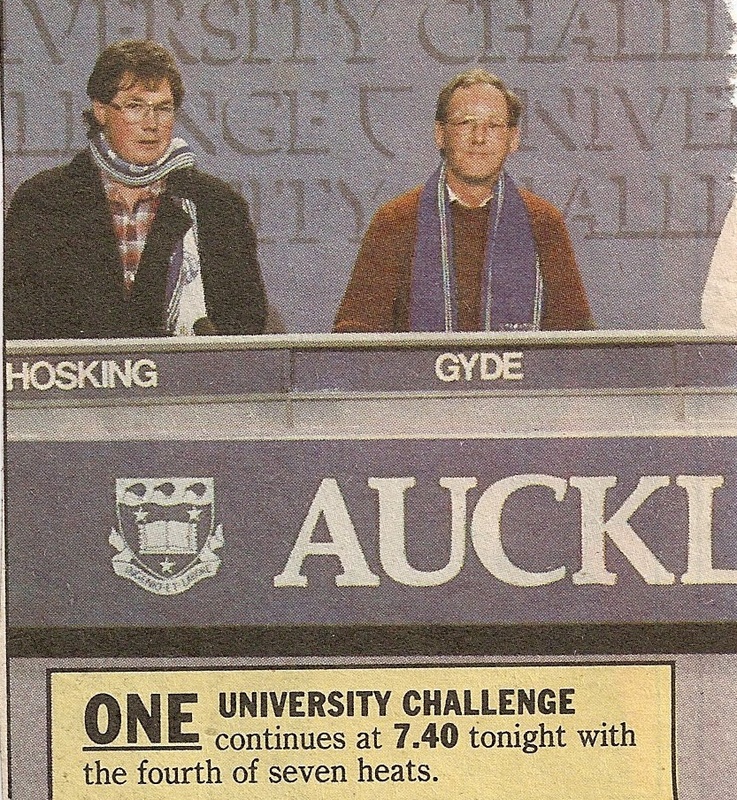 That was the last Uni Challenge they had in NZ.